One of the top wedding-related searches on Google is “Personalise your Wedding” as more and more couples strive to ensure their wedding day is absolutely true to them and their personalities. So why not start with a personal wedding ceremony? The beauty of hiring an Independent Celebrant like me to write and conduct your Wedding Ceremony is that the content is absolutely yours to choose and own. It really is the perfect opportunity to completely personalise your day and make it different from everybody else’s! To personalise things, couples should definitely try writing their own wedding vows to one another, but if you’ve no idea where to start there are tons of vow writing ideas to be found on the internet. I send all my couples a long list of example Vows, Personal Promises and Ring Vows that they can use as a starting-off point to cherry pick and tweak or add their own twist to. Wedding Vows can be short, simple and poignant, or much more involved. They can be a few lines long or stretch to a full side of A4 paper! Remember you’ll be reading these words out to your spouse in front of your loved ones so if you’re prone to being emotional it might be best to keep them brief! Why not ask a friend or relative to write you a bepoke poem? Alternatively they could read a particularly meaningful piece of prose or writing. If you have a Celebrant-led wedding ceremony you are not bound to those restrictive civil marriage laws as you would be with a Registrar so if you wanted a religious text, prayer or blessing then that’s fine too! Here you can see one of my couples during their mini hand-fasting as part of their personal wedding ceremony at One Warwick Park in Tunbridge Wells. You can see their hand-fasting cord bound around their clasped hands. Here are two single stemmed roses which are about to be presented to both mothers of an international couple as part of their English Wedding Ceremony. Other ideas could be a potted rose bush ready to plant in a garden, or a bouquet of roses (or any other flower for that matter!). A lovely way to thank your Mum for her unconditional love as a parent. After hearing that my couple got engaged in the Moroccan Desert and were going to be honeymooning in the Arabian Desert, we chose to incorporate this unity symbolism into their bespoke Wedding Ceremony. 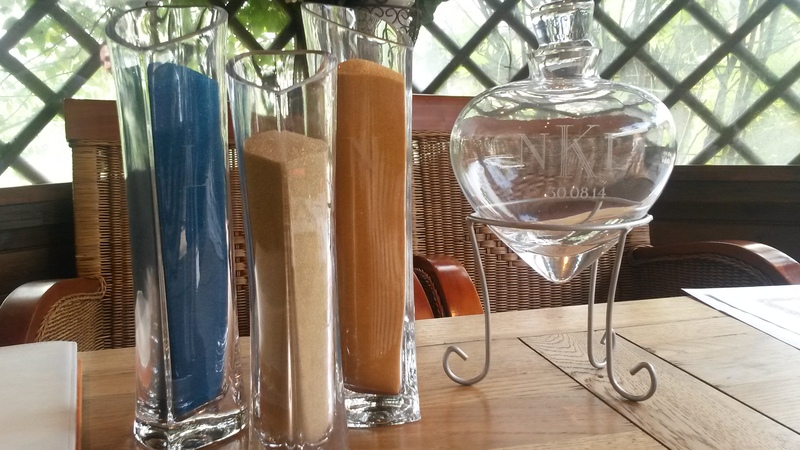 I started by pouring a foundation layer of sand at the bottom of the glass vase, after which the Bride and Groom layered the two other colours together in a pattern, signifying that their lives were now intertwined and impossible to part – like the grains of sand. This symbolic candle lighting will make a ceremony really quite special, and is designed to celebrate the joining of two individual people in marriage, and two families coming together. The two taper candles are lit by family members, and passed to the Bride and Groom who join those two flames to light the central unity candle. These sets can be personalised especially for you and easily purchased online from a number of retailers. 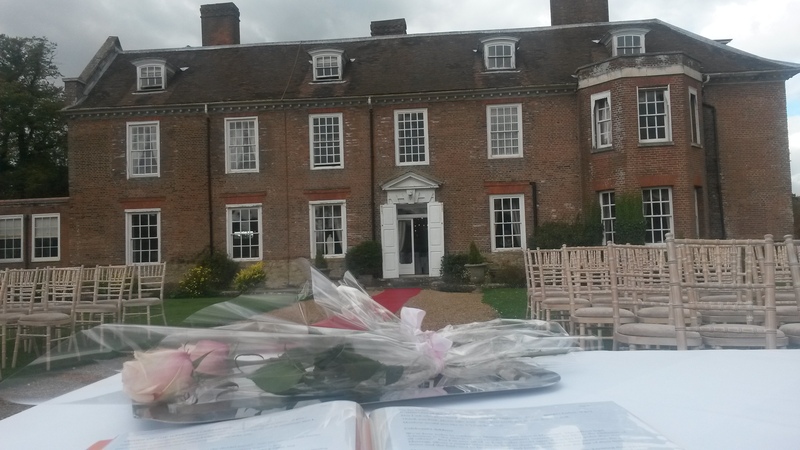 If you would like a personalised wedding ceremony that’s written just for you and tells your own love story please do get in touch. Take a look at my Contact Me page or complete my Make an Enquiry form. I’d love to hear your ideas! This entry was posted in Wedding and tagged celebrant, ceremony script, examples, google, hand fasting ceremony, hand-fasting, handfasting, ideas, Independent Celebrant, interesting, Kent, open air, outdoor, outdoor weddings, personalise, personalise your wedding ceremony, ribbons, ritual, rose ceremony, sand ceremony, search, symbolism, top, True Blue Ceremonies, unique, unity candle, unity candle ceremony, vows, Wedding Celebrant, wedding ceremony, wedding day, wedding-related. Bookmark the permalink.